Not only do swing voters find mail helpful, the majority of them read it. 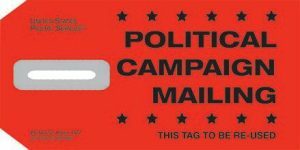 The online survey, conducted by Summit Research, found 54 percent of swing voters surveyed say they read political direct mail immediately upon receiving it and 24 percent will save it to read later. There’s opportunity for campaigns: 52 percent of swing voters surveyed say they’ve not received any political mail at their residences. In comparison, 80 percent of these swing voters report seeing political television ads. According to the Postal Service, spending on political mail increased from $176 million (October 2011–July 2012) to $268 million (October 2015–July 2016). Voters read their political mail. Sixty percent of voters read political mail about a candidate or issue immediately after receiving it, and 24 percent save it to read later. Voters find direct mail most helpful overall for learning voter registration deadlines. More than two in three voters surveyed (68 percent) say “direct mail sent to my home” is the top choice to inform them about registering to vote in their state, rating it either “very useful” or “pretty useful,” compared to ads on television (65 percent), online (52 percent) and radio (50 percent). Voters find direct mail “most helpful” overall for learning about early voting deadlines. Sixty-seven percent of likely voters surveyed find mail “very useful” or “pretty useful” for information on early voting deadlines, compared to ads on television (65 percent), online (52 percent) and radio (50 percent). Voters are issue-oriented when it comes to political mail. Voters are “most likely” to use political mail to learn about a candidate’s position on the issues (53 percent), followed by voting record or past statements (37 percent), biographical information (32 percent) and endorsements (28 percent). On behalf of the Postal Service, Summit Research conducted the online survey (August 11–22, 2016) among a national sample of 1,398 adults. Data are weighted to census-level targets for gender, region, race, age, education and income. The full survey sample also includes an oversample of millennials (n=699) that were weighted to census-level targets for gender, age, race, education/gender and marital status. Additional questions were used to screen for registered, likely and swing voters.